Below are the tasting notes on Pomerol recorded over the past few years between M-Z. Click here for the tasting notes on properties from A-L. Click on the links in the drop down menu to access the individual châteaux profiles. 2015 Deepish; less concentrated in colour than some; satin and red fruits on the nose; little oaky on the palate; less depth here than the best Pomerols; wood on the finish. Lacks middle and dry on the finish. Will fill out but not amongst my top choices in 2015 in this appellation. [75% Merlot, 21% Cabernet Franc, 4% Petit Verdot]. Tasted 6/4/16 Pomerol Seduction. Drink 2020-2028. 86-88 [Earlier note] Mid depth; red/purple at edge; full and sturdy Pomerol; some plum and cherry; perhaps a little straightforward; clean and easy; light Pomerol; not that much character. Simple. [73% Merlot, 24.4% Cabernet Franc, 2.6% Petit Verdot, 26ha]. Tasted blind Grand Cercle 3/4/16. Drink 2019-2025. 85-87. 2011 Deep and dark; oak resin, stalky blackcurrants; jam too; could be from anywhere in the world; some depth to the palate; tough tannin. Will it meld? Tasted bling at Cercle Rive Droite 1/4/12. 84-86. 2008 Deep looking; firmer nose; less showy and exotic [something of a relief]; more purity of fruit [the Delon guys]; firm palate, grippy with chew and extract. 89+ 2012 MW Institute Nov ’12. 2007 Deep and dense, tight to the edge; deep and plummy, earthy with tar and tobacco; attractive soft and easy palate; almost sweet entry; dense and a bit chunky but nicely done. 89+/100. MW Institute Nov ’11. 2009 Deep and saturated; lifted and silky on the nose with earthy plum tones alongside soft Cabernet Franc notes; cereal and cream; some chew on the finish but lots of depth. Needs five years and has closed up a little since bottling. Drink 2017-2030. 93+ MW Institute Nov ’13 [Earlier note] Mid depth, dark at core; not the densest; super ripe nose; very attractive; some jam but not loose; some lifted Cab Franc elements; sweet and some spices with plums; palate very full and ripe; lots of extract but also softness. Really very good. Coffee and mocha at the back. Tannins ripe. Well done. 92-94+/100 [75% Merlot, 17% Cabernet Sauvignon, 8% Cabernet Franc]. Tasted 31st March 2010. 2007 Mid red; attractive nose of truffles, violets; perfumed and precociously attractive; some tarry notes too; good concentration on the palate; finishes quite light but nicely perfumed and attractive wine. Fine. 90+/100 MW Institute Nov ’11. 2010 Deep and dense; lots of seductive oak and black fruits; toasty; oak dominate; lots of extract and oak and fruit tannin; early days but feels disjointed. Lots of flesh though but rather too chewy and extracted. Needs to settle. 87-88?/100 Tasted 6 April 2011. 2007 Mid red; some development; soft attractive nose; quite simple; some vanilla tones at the back; soft. 84/100 UGC London tasting Oct ’09. 2011 Deep looking; saturated, jammy nose; quite thick; some toffee; rather worked and ripe, later picked style; jam and oak on the palate with lots of tannin – fruit and oak; feels overdone. Oak very dominant and tannin very dry. Tasted blind at the Cercle Rive Droite 1/4/12. 83-85? 2011 Deep, dark and arterial; thick and deep; feels a little contrived; rich and deep palate; lots of oak; very sublimated [terroir sublimated too]. Tannic at end. Very extracted overall. 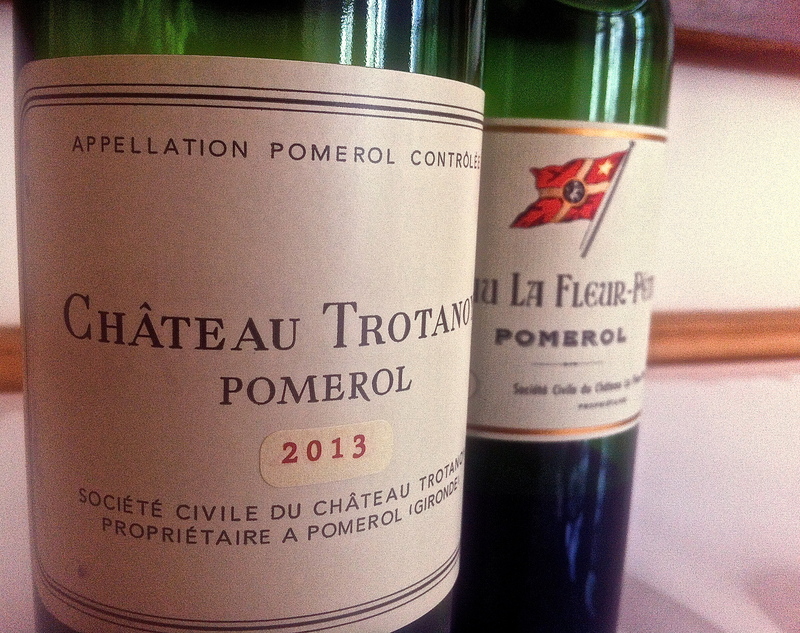 Pomerol or Chile? Tasted blind at the Cercle Rive Droite 1/4/12. 82-84?